Scientists warn, you can inhale and /or absorb chlorine vapours and other pollutants while showering. Tests show that the body absorbs more chlorine by taking a ten minute shower than by drinking 8 glasses of the same water. The SH-CQ/3 utilises the latest multi-stage filtration technology,consisting of polypropylene pre-filters, KDF-55 ‘Golden sand media’ and special flow improving baffles. Firstly the pre-filter mesh removes dirt and sediment from the water, prolonging the life of the shower filter. The KDF-55 ‘Golden sand media’ then removes up to 95% of harmful chlorine and chemicals from the water, along with up to 98% of soluble heavy metals. This gives you a luxurious shower free of bleaching and harmful chemicals, the benefits are not only restricted to you health however. People who have coloured hair and highlights will notice that without the bleaching effect of chlorine, the colour of their hair will stay more vibrant for longer. Expensive soaps and shampoos designed to be mild are counteracted by chemicals in water, experience their true effect with pure clean bathing water. You will experience greatly reduced skin irritation when showering, even without the use of expensive bathing supplements. Vapours containing bleach will be nearly eliminated, therefore relieving any nasal irritation you may be suffering from. Our latest shower filter also contains special flow baffles; this means the filter can be used for both high and low pressure applications. 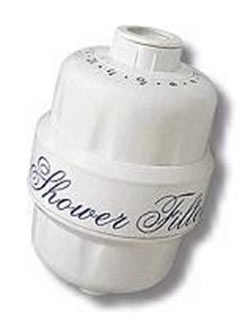 Useful renewal reminder numbers: Twist the dial to correspond to the date you began using the shower filter. The shower filter should be changed after 12 months use.